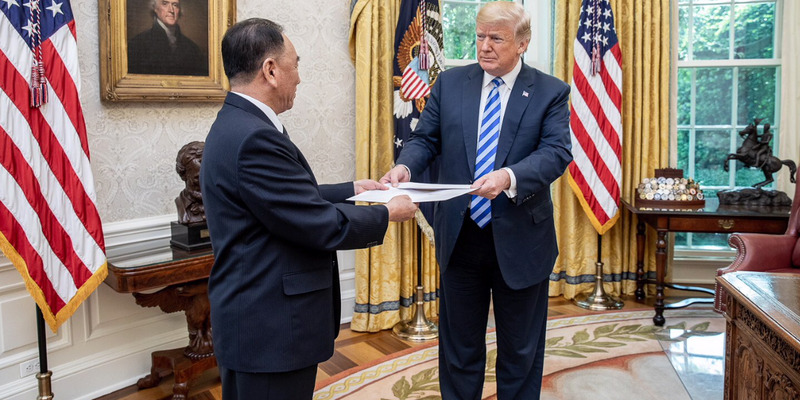 Shealah Craighead/White HousePresident Donald Trump is presented with a letter from North Korean Leader Kim Jung Un, June 1, 2018, by North Korean envoy Kim Yong Chol in the Oval Office at the White House in Washington, D.C. While the actual letter was not seen publicly, a North Korean official also presented Trump with a symbolic, oversized novelty envelope, and the two men took a picture with it in the Oval Office. Trump later teased the contents of the letter, but told reporters in the afternoon that he hadn’t yet opened it. US officials with knowledge of the letter’s contents said it did not make any noteworthy threats or concessions, and was seen as a positive gesture. President Donald Trump received what he called a “very nice” letter from North Korean leader Kim Jong Un on Friday. 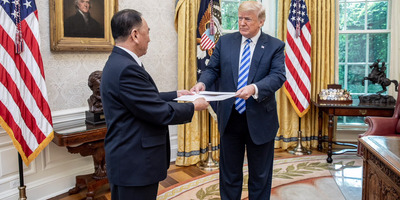 While the actual letter was not seen publicly, North Korean vice chairman Kim Yong Chol presented Trump with a symbolic, oversized novelty envelope, and the two men took a picture with it in the Oval Office. Trump later teased the contents of the letter, but told reporters he hadn’t yet opened it. North Korea made a similar gesture with its neighbour to the south in February, during the Winter Olympics. Kim Yo-jong delivered a personal letter to South Korean President Moon Jae-in on behalf of her brother, Kim Jong Un at the time. Kim Yong Chol, who delivered the letter to Trump on Friday, also met with Secretary of State Mike Pompeo. US officials with knowledge of the letter’s contents said it did not make any noteworthy threats or concessions, and was seen as a positive step, according to multiple newsreports. Trump is scheduled to meet Kim Jong Un in Singapore on June 12, which will mark the first time a sitting US president will meet face-to-face with a North Korean leader.